True Angle Support - Created to be flush with an 8mm shoe, our pads are designed to address negative palmar angle issues . Stud Inserts - Our pads are the only product of their kind available with optional added traction. Durability - Made from our high quality material, our pads are intended to be used for multiple resets. All Flip Flops are produced in comparable sizes to industry standard shoe sizes. Please refer to our sizing charts for more detailed information. Available in Soft (80A) and Firm (90A). Two degree wedge. Available in Soft (80A) and Firm (90A). Two degree wedge. Available in Firm (90A). Flex Step® Shoe Pads offer superior design features to support your horse in ways other pads can't. Longevity - Flex Step® Shoe Pad material was created to retain its integrity to offer uniform shock absorption for multiple resets. Hoof Health - Compared to plastic & vinyl pads, our natural material offers remarkable improvement of hoof health throughout the duration of a shoeing cycle. Unique Benefits - Flex Step® Shoe Pads shape to the foot without absorbing moisture, swelling or creating pressure points. Correctional Support - With a two degree wedge, the Flex Step Shoe Pad offers correctional support for negative palmar angle issues. Available in 3mm and 4.3mm. Cut to size. Two degree wedge. Available in 3mm and 4.3mm. Cut to size. 1. How do you determine which side of the Shoe Pad to apply to the hoof? This is based on user preference. You'll notice that one side of the pad is textured while the other side is smooth. 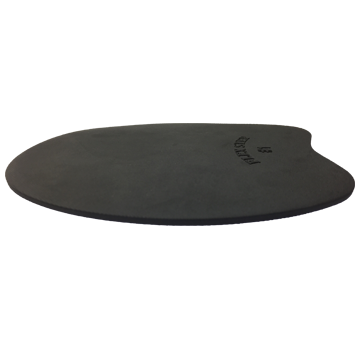 We recommend applying the textured side of the pad so that it comes into contact with the hoof. We believe that this reduces movement of the pad against the hoof. 2. What makes a horse a candidate for the Flip Flop? The most common cases Flip Flops are applied with are: sore heels, sheared heels, negative palmar angle and quarter cracks. We have also seen success using Flip Flops with horses who have challenges with interference. 3. What does the writing on the Flop Flop & Shoe Pad mean? Each of our Flip Flops and Shoe Pads have a date stamp & initials. This identifies them as a flat or a wedge form, in addition to indicating their hardness.